From left to right: Prince George’s County Executive Rushern Baker, President of the Maryland Space Business Roundtable and VPA of Science Systems and Applications Anoop Mehta, Sen. Barbara Mikulski and Gamera team member Ben Berry. On April 15, 2013, the Maryland Space Business Roundtable (MSBR) presented a check for $2500 to the University of Maryland's Gamera human-powered helicopter team during the Space Business Roundtable lunch held in Hyattsville, MD. The MSBR is an organization that encourages the growth and development of aerospace-related business in Maryland and invests in future technologies by supporting educational outreach programs throughout Maryland. 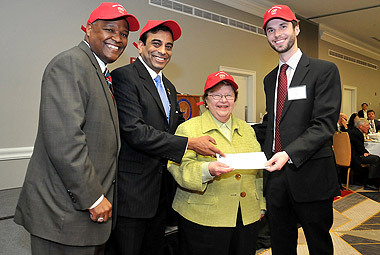 Gamera team leader Benjamin Berry was on hand to accept the check presented by Maryland Senator Barbara Mikulski, Prince George’s County Executive Rushern Baker, and MSBR President and VPA of Science Systems and Applications Anoop Mehta. Baker, Mikulski, and Mehta showed Terp spirit by sporting ‘Team Maryland’ hats during the presentation photos. The Gamera Project, which has recently been featured by Voice of America and the Wall Street Journal, is a student design challenge inspired by the American Helicopter Society (AHS) Sikorsky Prize that calls for the creation of a solely human-powered helicopter capable of ascending over 3 meters, remaining in flight for over 60 seconds, and maintaining flight within a 10-square meter space. The Gamera team, comprised primarily of aerospace engineering students from the Clark School of Engineering, currently holds the world record for flight duration, at 65.1 seconds. And with another test flight on the horizon, the Gamera II team is hopeful that they are closing in on the prize. For more information on the Gamera project, visit their website or find them on Twitter at @UMD_Gamera. For more information on the Maryland Space Business Roundtable organization, visit their website.